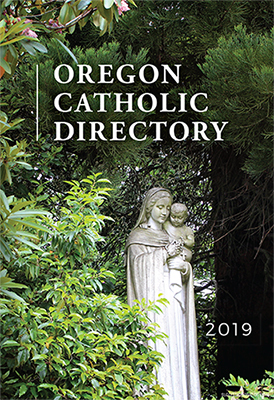 It’s time to order your 2019 Oregon Catholic Directory, now available in print and digital editions and in full color. Whether you like pages in your hands, or a PDF file you can access with computer or smartphone, this 236-page document offers information you can’t find elsewhere about pastoral center offices, parishes, clergy, religious, schools, helping agencies and Catholic organizations. Need a marriage record? Want to attend Mass while touring the coast or central Oregon? Need to send a fax of vaccination records to school? Want to call a senior residence, construction firm or another Catholic-friendly business? Compelled to send a note to your music teacher from the days of yore, who now lives in a convent retirement center? The directory makes it all possible. Those who order the digital copy get a bonus. We’ll be updating the content every four months. The directory is a tool of unity. No other resource collects the entire scope of the church in Oregon. Think of it as the address book of your extended family. Creating the directory each year takes many hours of work from many people who have families, and so we pay them. We do it gladly because it’s helpful to you and because it unifies the Catholic Church of Oregon, but we need to make ends meet. Beginning this year, we’re asking parishes to pay for all their copies. To order, go to catholicsentinel.org and click the banner just below our main news stories or call 888-212-8730.